The situation in the European table grape market has been quite challenging. Because of the large volumes supplied by Peru, German, Dutch and French traders have at times had to deal with extremely low prices, especially at the beginning of the season. In the meantime, the market has been picking up slowly in several countries. Prices in Italy are also low, mainly due to the disappointing quality. For Spain, these are interesting times, because its grapes have recently gained access to the Chinese market. North America has made the switch to imports after an abundant Californian season, while the production in Australia and China is in full swing. South Africa has had a difficult season, but hopes for a good end. Italy is the second largest grape supplier in the world, only behind China. At the moment, the production amounts to about a million tons. The fruit comes mainly from Puglia and Sicily. In Puglia, the season has mostly been characterized by low prices, unexpected weather conditions and a substandard quality. Many growers have had to deal with rot, and these problems are largely attributed to climate change. In Sicily, the season started well, but unfortunately, that didn't last. Many growers had to deal with bursting grapes at the end of the season, which had an impact on sales. Italian consumers prefer small and average bunches. The grape market did not have a prosperous start in 2019. According to Dutch importers, there was still supply in the market before Christmas, and large volumes have also arrived afterwards. Peru was mostly responsible for this, with no less than 100% greater volumes than last year. In the past month, the situation has been really good for Red Globe grapes. Due to the good demand from Asia, Peruvian exports of this variety were reasonably low. South Africa had 12/13% more production, and Brazil, where the season is about to end, has had 15% more production. This resulted in promotional campaigns in the German retail channel, with stunt prices of 99 cents. In the meantime, the shipments from South Africa have slowed down somewhat. India expects a 15% higher yield this year. 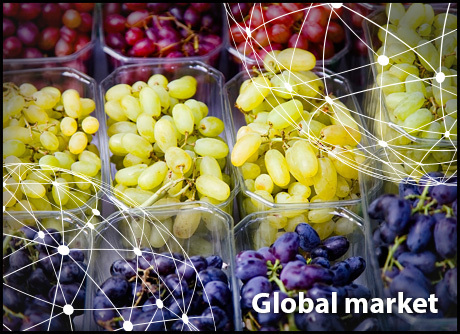 Although the market conditions are not very favorable at the moment, they are expected to start improving for the white seedless grapes from India in the second half of February. Normally, the Indian season lasts until mid-May. Temperatures have been a bit low in the last two weeks. The great difference between night and day temperatures will very likely have an adverse effect on the grain size of the later varieties. In the last four weeks of the season, the size of the grapes will thus be on the smaller side. The supply is high on the French market. "Almost all white grape varieties and origins are currently available. South Africa, Peru and Namibia are shipping large volumes of Victoria, Regal Seedless, Sugraone and even Thompson. There are also still some French muscat grapes on the market, but that campaign is nearing its end," says a trader at Rungis. Almost all varieties, both white and blue, are sold for a price per kilo of about € 1.80 in the case of caliber L and € 2 per kilo in the case of caliber XL. According to the trader, the quality is good, but the consumption is lagging behind. The bad winter weather has also been causing difficulties. The only positive exception to the low prices is the blue Ralli grape. "This one is easily sold for over 1 Euro more than the other varieties, with € 3 per kilo for caliber L and € 3.20 per kilo for caliber XL. This variety is easy to sell. It is crunchy and sweet, and besides the Crimson, no other variety comes even close in terms of taste. What also makes a difference is that the Ralli volumes are very limited. "The Red Globe is still widely available in France, but other seedless varieties, such as the Crimson and the Sweet Celebration, are slowly taking over the market. "We are certain that the worst part of the white grape season has already been left behind," says a German importer. "The market situation is now slightly better, probably thanks to the marketing campaigns carried out by major retailers, who have a 50% share of the German market. Therefore, if they have promotions, sales increase considerably. "The supply of white grapes from South Africa is decreasing because the harvest is already over in the most important production areas. Most other African producers have switched to the cultivation of blue seedless varieties," explains the trader. "We expect the first shipments from India in week 9 or 10. Until then, the market for both packaged white grapes and those sold in bulk will slow down." Prices are having to climb from an extremely low level, but they are increasing consistently. "For white grapes, prices have improved over the past few weeks, both on the free market and in the framework of existing programs. Unfortunately, the prices for blue grapes are still under pressure." "We still expect large volumes from South Africa, and hope that the supply from Peru will have stopped by that time. South Africa expects a big harvest. That fruit should come our way in late February / early March." Despite the concerns, the importer expects that actions in the retail channel will give red grape sales a boost. "If this is indeed the case, the market could recover within a few weeks." While the volumes from traditional producing countries have not risen significantly, Peru has tripled its export volumes to Europe. This caused some oversupply on the market. For 2018-2019, the total Australian production is estimated at 200,000 tons. Of these, 130,000 tons are intended for export (65%) and 70,000 tons for the domestic market (35%). The production for export is expected to increase by 20,000 tons this season. A grower from Victoria says that several heat waves have been recorded across the region in the last week, with temperatures rising to 45 degrees Celsius. There has also been less rain than normal throughout the year. Despite the weather conditions, an above-average year is still expected in terms of volume. Japan and other Asian regions remain the most important export destinations for Australian grapes. A grower says that "we have to make the best of the heat waves. Because of the extreme weather, our grapes have an exceptional taste. They have the right balance between sweet and sour, and we deliver a fresh product thanks to the short journey. The consumer knows this, and is prepared to pay more for Australian products." In 2018, the quality of Chinese grapes was not ideal. The main reason for this is the fact that there was a lot of rain during the harvest season in several important production areas, which took a toll on the grapes. The fruit has consequently had a limited shelf life, making it unsuitable for long-term storage. The Chinese grapes currently on the market come from Xinjiang. These are high quality grapes and there is a stable market for them, with little changes in terms of prices and export volumes compared to last year's season. The grapes are mainly exported to Asian countries and Russia. The grapes hit the market in November and will remain available until the end of February. Many grapes are also imported into China. At the moment, imports are a little higher because of the upcoming Chinese New Year, as imported fruit is more popular at that time. Spanish grapes have only recently gained access to the Chinese market, so there are not yet many Spanish grapes available, but Chinese importers are interested in them. Furthermore, seedless grapes are becoming increasingly popular. The season has ended in the earliest South African production areas. It has been a difficult season. The Orange River region started late, and the sizes of some varieties did not meet the requirements of the Chinese market, meaning fewer grapes were exported for Chinese New Year than the sector had hoped for. The smaller Olifants River region has also had a difficult time, mainly due to drought. Last year, several growers cut off their vines. As a result, the region has supplied little or no volumes this year, and the effects of the drought are still visible. In Hex and Berg, the harvest started around the New Year, right on time. The peak in the blue grape supply has yet to be reached, especially in the case of the Crimson Seedless, Red Globe and Autumn Royal. By the end of week four, more than half of the packaged volumes had been shipped. The ranking of most important destinations is topped by the European market, followed by the United Kingdom and Canada. Some called the Canadian market the welcome surprise of the season. This week, the South African Table Grape Industry predicted a positive end to the season. The Californian season is coming to a close with perhaps the largest production volume ever. The volumes have been about 5% higher than last year. The quality has been good, too. This large production is mostly due to the good weather conditions, but also to the planting of new varieties and the use of more efficient cultivation systems. The season has gone well. In addition to the good supply, the demand has also been high; however, the import taxes in China created new challenges, including the opening of new markets. There have been major price swings this season, depending on the variety and quality. Rising costs, taxes and the expansion of varieties and growing regions have also occasionally caused some financial setbacks. With the end of the Californian season in sight, the US is currently importing from Chile and Peru. The shipments from Peru have been arriving to America since the end of December. Before the New Year there was still a lot of Californian product on the market, leaving little room for the grapes from Peru. The situation has improved considerably since then. In January, the market for Peruvian grapes was even more stable than it has been in other times. This is partly due to Peru having exported large cargoes to destinations outside the US, also taking advantage of the situation on the European market. Exporters say that the volumes from northern Peru are running out, and that the production is now switching to the more southern growing areas. The harvest also continues in Chile. The marketing of blue seedless varieties is coming to an end with late varieties such as the Timco and Allison, which are produced in Vallenar and Copiapo.